Hello crafters and non-crafters. I am back, altho, I never really left. So to start we’re gonna back up. Here’s a couple of projects I made in early August. 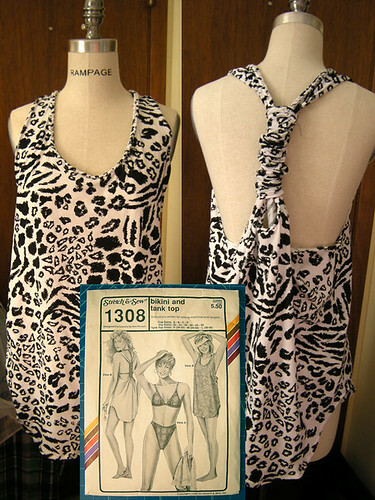 This is a super cute pattern from Generation-T, project 22 in Generation-T Beyond Fashion. It’s a cute babydoll dress. I made a few changes to the pattern. 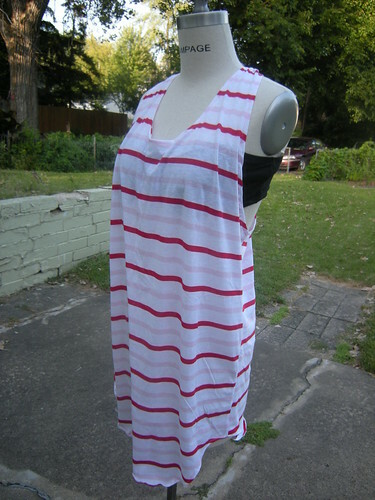 First off, the pattern calls for you to use a fitted shirt for the top part, and a baggy shirt for the bottom. I really wanted to use the Google shirt, so I used a pattern (I used this same bust-top pattern for my maternity dresses) for the top. And I added the pockets myself, because pockets are awesome. Perfect to pair with leggings or jeans for the weekend. 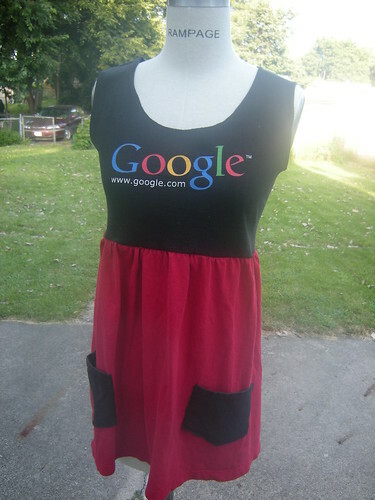 One of the best parts about the Google t-shirt is that my super awesome husband got it at a garage sale for a quarter. A QUARTER. I love garage sales. I have been sewing up a storm lately! 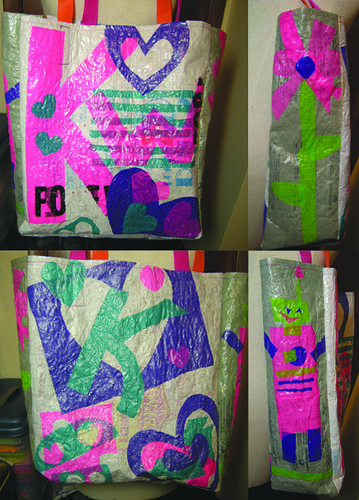 Shirts for my nieces and I, recycled plastic bags and more. On Friday, July 3, my mom and I decided to visit some fabric stores, look at patterns and get inspired. We got some GREAT deals – between Jo-Ann’s and Hancock’s I got $208 worth of patterns (that would be 12 patterns total) for $18. It was a great day! I’ve accomplished quite a bit over the last few weeks, but haven’t had a chance to get it all up and going, so this is going to be a mega-project filled entry. 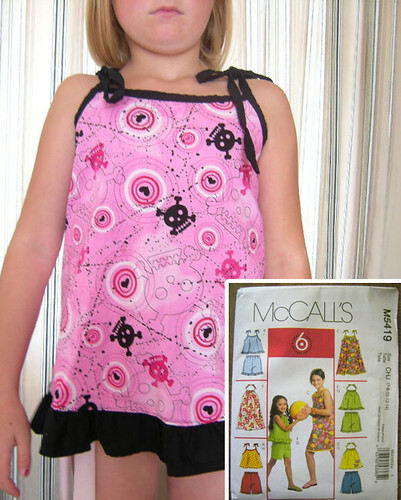 First things first, sewing for kids! This is my 8 year old niece, Brooke. She's a hipster punk kid who loves farming and pink/black skulls. 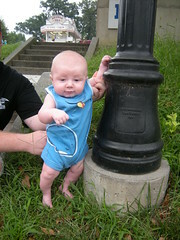 This pattern is current, but her mother remembers wearing similar tie-at-the-shoulder shirts as a kid. This is my 4 year old niece, Jade. She's rocking the Spring Ruffle Top, with bugs. 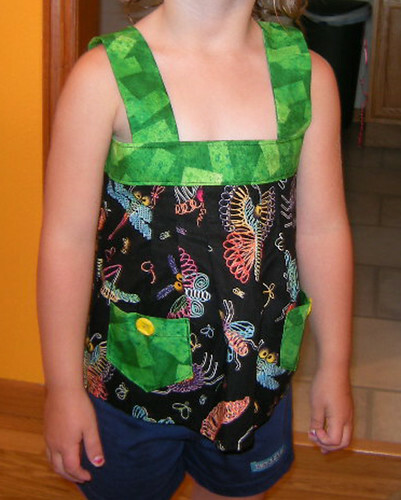 I had to adjust this pattern a bit for kids - made the straps 1.5in instead of 2.5in etc. I also skipped the ruffles because she's not really a ruffle girl. There's bugs on her shirt! My friend Karri is packing her bags and moving from IOWA to NYC. Wow! I'm so excited for her! I wanted to make sure to send her off in style with this recycled plastic bag. Our favorite side is the robot. What do you think? 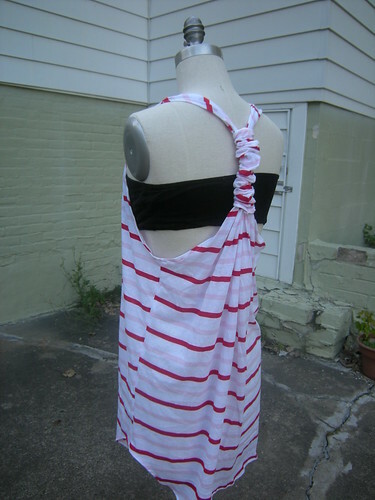 Last but not least, this classic Stretch & Sew pattern. I found this in my basement a few months ago and have just been WAITING to find the perfect fabric to make it. Actually, I made one a few weeks ago on a double knit and painted on it, it's too thick. Anyways, this is going to pair perfect with my new bike shirts and neon sports bra. This is the first time I've sewn on knit, luckily these S&S patterns are pretty easy. I had to redo one of the arm holes because it was really wormy. In the end, I added a braided cord (same fabric) to the neck and it lays perfect now. I'm hoping I make it onto LATFH.